Today, one way new immigrants can speed up the process of becoming an American citizen is through military service. After September 11, 2001, President George W. Bush created a program that lets green-card holders who enlist in the U.S. armed services bypass the typical five-year residency rule and apply immediately for citizenship at no fee. This program has created 83,000 new American citizens. More than 10% of naturalization ceremonies for military personnel have taken place in 28 countries abroad, including 3,412 in Iraq, 2,102 in Japan and 1,134 in South Korea, according to U.S. Citizenship and Immigration Services, which administers the process. In 2008, a one-year pilot program – called Military Accessions Vital to National Interest (MAVNI) – was approved. The program allowed the armed services to tap noncitizens without green cards — here on temporary visas or under refugee or asylum status — to naturalize to help satisfy military needs for specific language or medical skills. 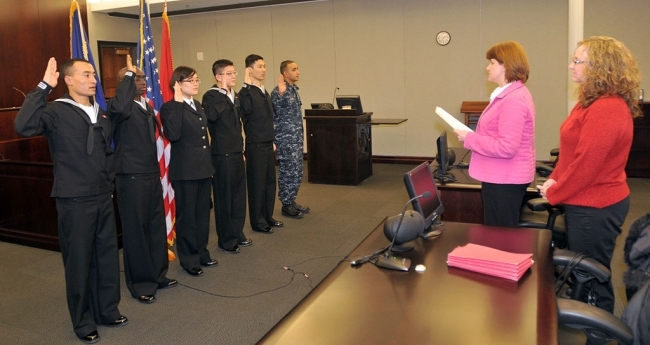 In May 2012, the program was brought back for an additional two years with a cap of 1,500 new citizens. As of April 2013, the Army had enlisted fewer than 600 soldiers, and no other branch had used the MAVNI program. The program has since been extended through September 2016.